Bighorn sheep block Eastside Road in Penticton. 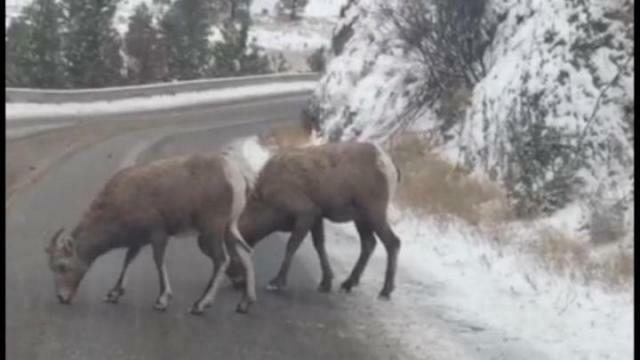 Bighorn sheep blocked Eastside Road in Penticton to lick up some road salt. Dec. 23, 2016 5:00 a.m. Headed home along Eastside Road, Rachelle Wirth had to put on the brakes for a bighorn sheep traffic stop. Several sheep were headed down the hillside and toward Skaha Lake, but on the way paused for a snack — road salt. The animals licked up the salt along the road causing an extra long wait for Wirth. Salt used by road crews to help with slippery sections is an attractant for many wildlife. In fact many wildlife officials are sounded the alarm for motorists to watch out while traveling on B.C. roadways as these animals might be looking for a treat. They warn not to get out of your vehicle to push the animals away. Have a great wildlife photo or video to share? Head to our Facebook page and share it with us!